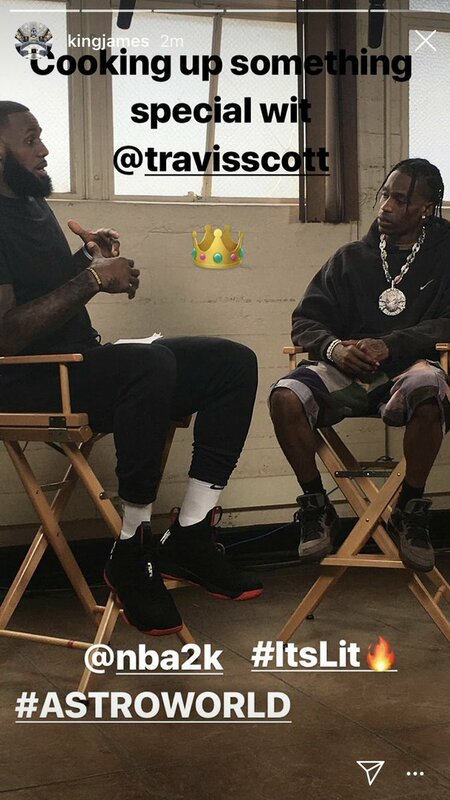 It looks like LeBron James & Travis Scott are cooking up something special at the moment, we just know what it is yet. On Wednesday, the Lakers new superstar revealed via his IG story that he & Travis were working together on secret something. James shared a still frame pic of him and Travis sitting in a directors chair and talking face to face as if some sort of interview. If there’s any guesses as for what the two were cooking up, it could have something to do with the upcoming NBA 2K19 game, which James tagged in the photo as well, along with #Astroworld & #itsLit. However this is speculation as we’re going off the hashtags and picture, but NBA2K also tweeted out the photo, adding more fuel to the rumor. James has been rather outspoken recently about being a fan of Travis’ new Astroworld album. The King gave Travis a nice shoutout on his IG story over the weekend and was spotted working out to the album, specifically “Sicko Mode” with Drake. While we wait to find out what these two superstars have up their sleeves, check out James’ photo from earlier (below) and let us know what you think.